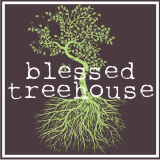 Blessed Treehouse: Six weeks between them. Looking at this picture, one might think there were six months between them! The funny thing is that it won't be long before he's the one dwarfing her. Thank you, Lord, for Harper Lynn and Jenson Reed. The kids had their 18 month (Henry) and 2 month (Harper) check-ups on Friday. Henry weighed 24 pounds, 8 ounces, and he measured 33 1/2 inches long. He survived three shots, and according to the doc, he is right on track for his age. Harper weighed 11 pounds, 6 ounces, and she measured 23 inches long. She also survived three shots, and like her brother, she is right on track for her age. Loved getting to meet Jenson Sunday. He is so cute! How many chins ya got there, Miss Harper? ;) LOVE her! Two sweet little peanuts! So cute! What darling names, and what a precious photo, Ali!